Health Care Insights - From Policy to Practice: Register for the FDA/CMS Summit for Payers by Friday 11/14 to Save $300! 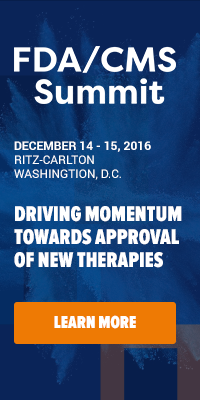 Register for the FDA/CMS Summit for Payers by Friday 11/14 to Save $300! Attend the FDA/CMS Summit for Payers to initiate the collaboration, with top government and key regulatory bodies working closely with healthcare leadership to join forces and build an open culture of harmonization to provide efficient and affordable healthcare to all patients. This meeting stemmed from the infamous Solvaldi case, as the FDA approved the specialty drug to go to market but with it being so expensive, it caused major problems for the CMS and health plans. No longer can regulatory bodies work in silos, it's time for collaboration! But hurry—time is running out! Register by this Friday 11/14 and save up to $300 off the two-day rate. Or, if budgets and time are tight, choose the one-day option and attend for only $895. Be sure to use the code XP1917BLOG to save. If you haven’t already done so, download the brochure to see the full speaking faculty, including some of the most influential people in health care.